Action cameras generally follow one of two designs, box or bullet, but the small Stealth 2 is a mixture of the two. It looks very similar to the larger Drift Ghost-S with the same long rectangular shape, twist lock back, screen on top and rotating front lens element. This design made the Ghost-S exceptionally easy to mount, but the size and weight of the Ghost-S can be an issue, but while the Stealth 2 looks similar it's 40% lighter and 50% smaller. Physical appearance is where the similarities end because the Stealth films at 1080p at just 30fps compared with 60fps on the Ghost-S. The screen on top is just for navigating through menus rather than offering Live View, the battery is internal and it requires a waterproof housing if you want to venture into water. There are also a few differences with the way the Stealth works when it's controlled by the mobile app. 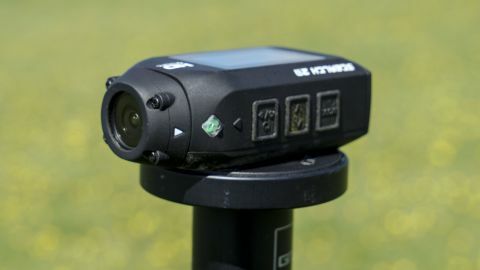 For the most part, though, the Stealth 2 is still very much part of the same 'get out there' action-ready family, despite its differences with Ghost-S.
An action camera's mount is always an important aspect of any system and while the GoPro mount is at present by far the most popular, Drift has been around for a few years too, so there's a good selection of bike, chest to helmet mounts out there. Prices are very competitive and the mount quality is very high. The mount itself is a simple compression clip – you just slot it in and it's attached – yet despite this simplicity it holds the camera nice and firm with no play. which is important in order to avoid vibration when attached to moving vehicles or people. This design also makes it easy to remove the camera quickly just by pinching the release tabs, so there are no fiddly knobs or bolts to undo. The compression clip itself fits to the bottom of the camera casing and can be removed to reveal a standard 1/4-inch thread, meaning that the Stealth is able to mount straight on to a tripod without the need for any additional accessories. Underneath the compression clip is a standard 1/4-inch tripod socket. Settings and start/stop recording are all set through the three buttons on the side, with the illuminated LCD on top letting you know where you are and what settings you've selected. The mode button enables you to cycle through the modes, which include movie, stills, time lapse and burst and also give access to the settings. There's also a handy car DVR mode which can be activated in the settings. Once the Stealth is on, the power button doubles as 'select' and the middle button enables you to scroll through the settings. All areas of the interface are well thought out and finding the settings that you want to adjust is all relatively easily.